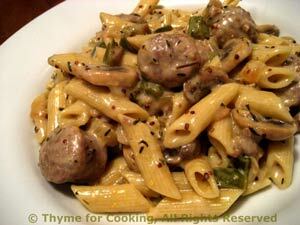 Pasta with Sausage and Mushrooms, Thyme for Cooking gourmet menus. This should use up the mushrooms and the Greek yogurt... Cleaning out the fridge. Toss in any other bits of veg you have lurking; finish with some fruit.